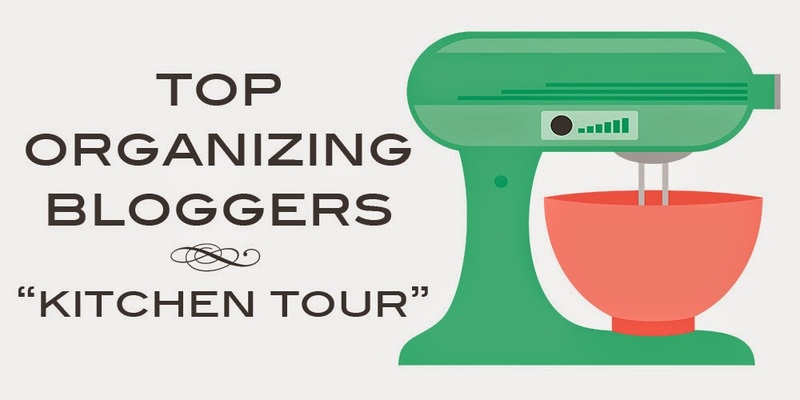 of Organizing Bloggers' Kitchens !! 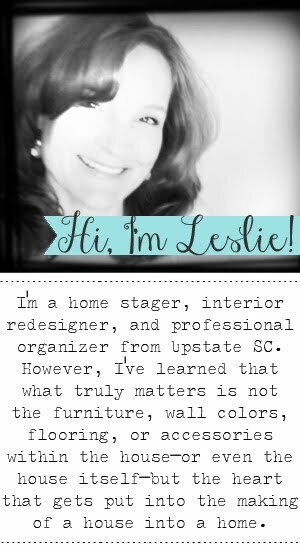 As a professional organizer, I am excited that I get to share both my love of organizing with you, as well as the creatively frugal ideas that I use to simply keep my sanity in my own home. 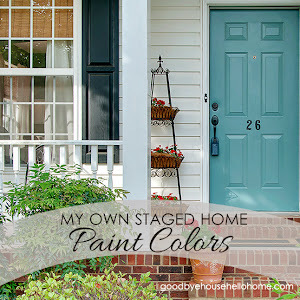 Maybe you can use some of these ideas, too? Today, we’re in my kitchen. I am one descendant in generations’ worth of bakers. Bakers that bake in bulk. 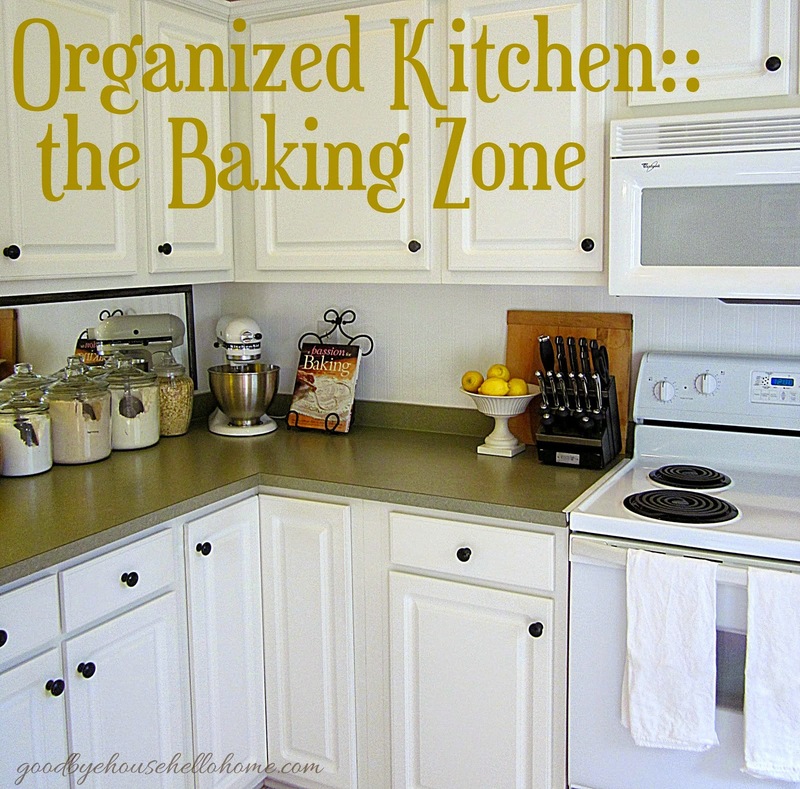 One corner of my kitchen is the baking zone. you may need to re-think the location of these things. Store items in a way that makes sense and saves steps. 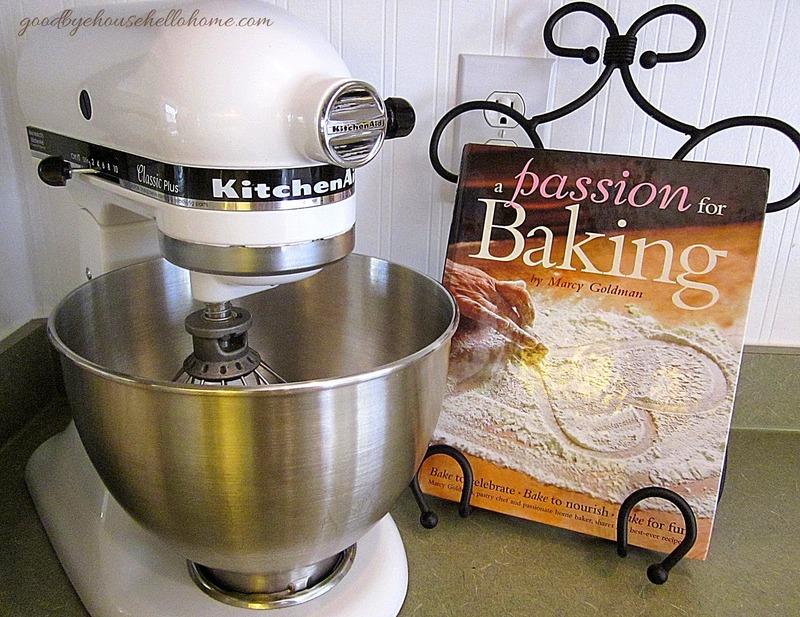 Almost all of my baking necessities are within arm’s reach in this corner. 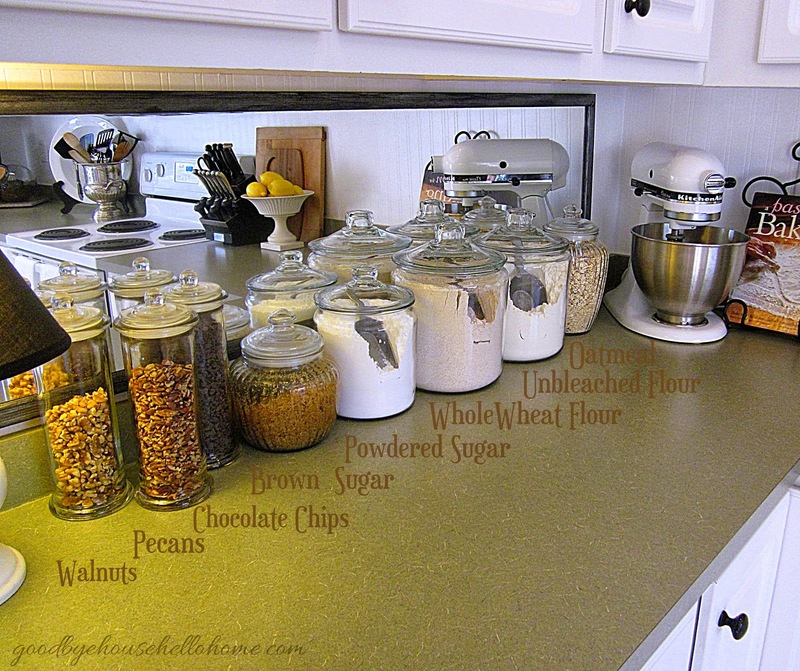 I love having my dry goods in these glass containers. With a glance, I can tell if I am running low on something. Last year, I was about to put this wardrobe mirror in the yard sale pile. I remembered the mirror, measured it to see if it would fit, and here it hangs across from the window, reflecting light and doubling my dry ingredients! It also gives a whole new meaning to “watching what you eat”. I found the jars and metal scoops at Wal-Mart. 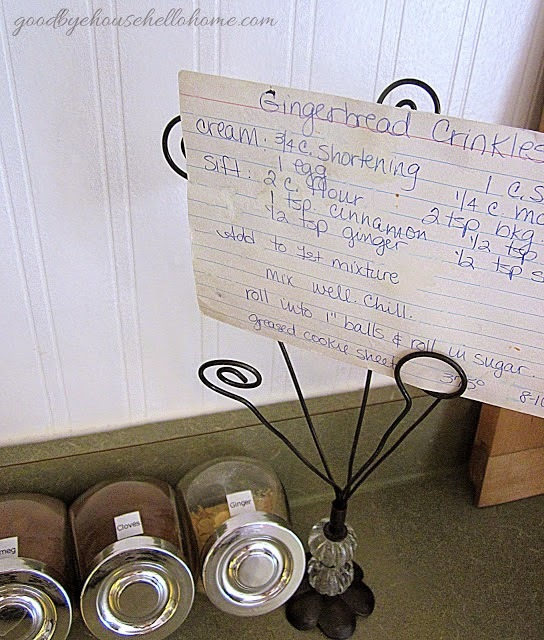 that we actually liked, copied them down onto recipe cards, and now I only have a few cookbooks. I mostly get my recipes from the internet, so I use my iPhone a lot as a "cookbook". 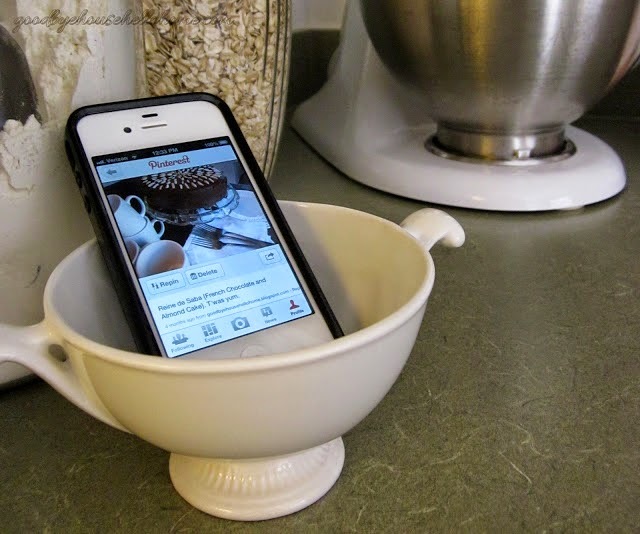 When I see a recipe I want to try that I’ve pinned on my Pinterest HERE, I plop my phone in this vintage sugar bowl (which has long since lost its lid) and have a paper-free means of making something. If it passes “inspection”, it gets written down and put into My Recipes cookbook. Let me show you the insides of the cupboards. 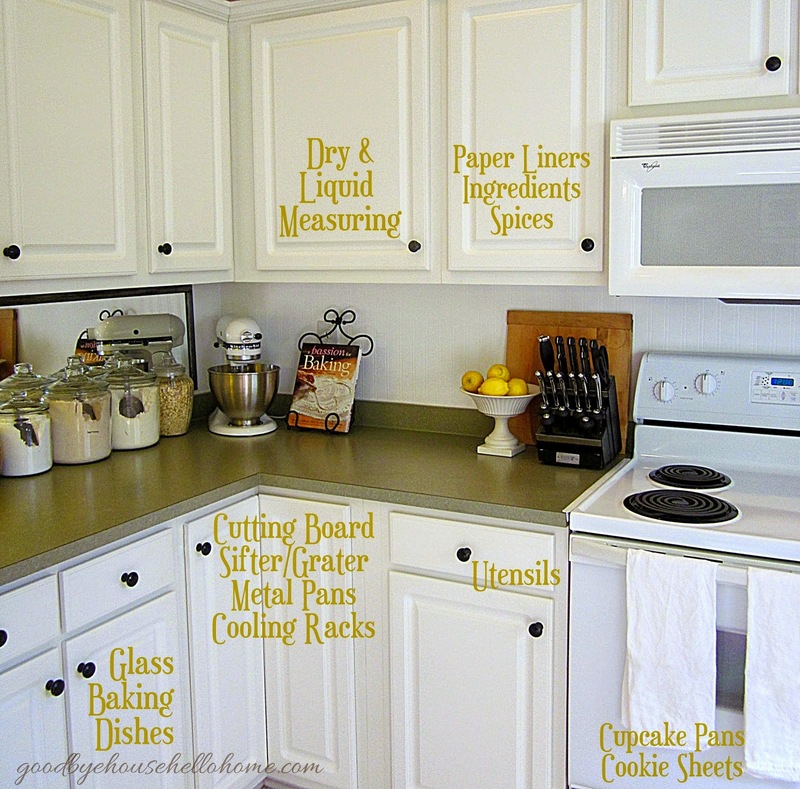 The top shelf holds the least-frequently used items, the pastry mat and rolling pin, cookie cutters, and icing stuff. 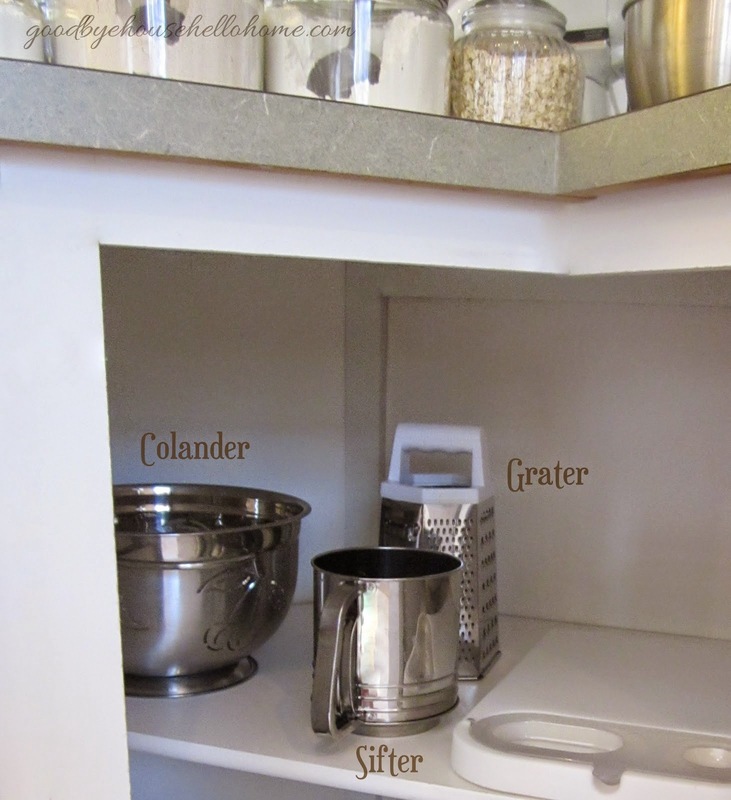 The middle shelf holds the smaller measuring utensils. 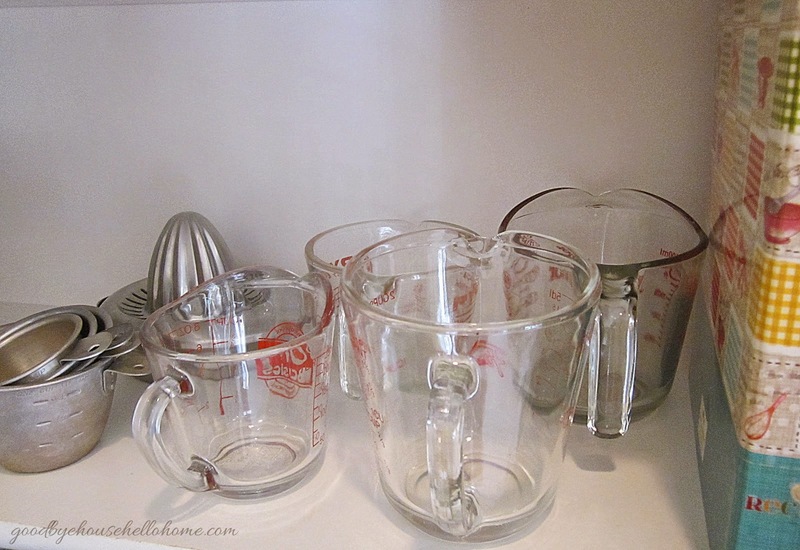 And, of course, the lowest shelf holds the larger, heavier measuring bowls. This is the cabinet to the right of the one above. 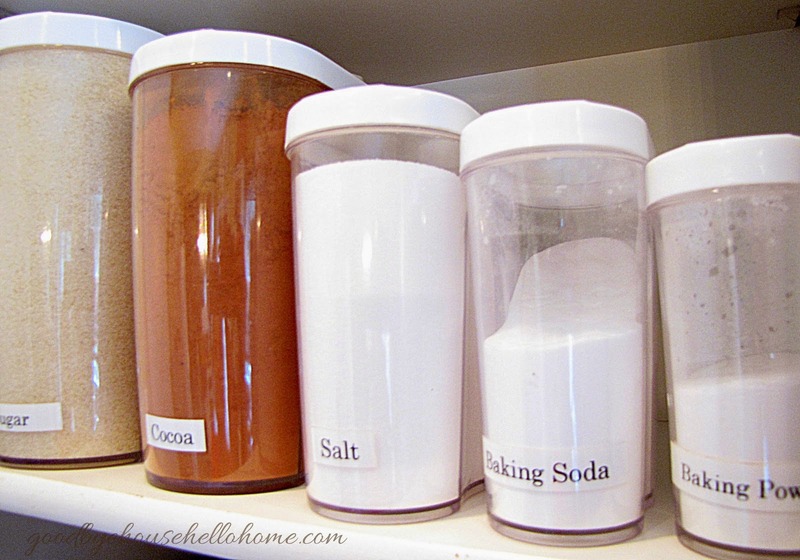 Sugar, cocoa, salt, baking soda, and baking powder are kept here. These are also handy because their lids have a slide closure so I can neatly pour out the contents. 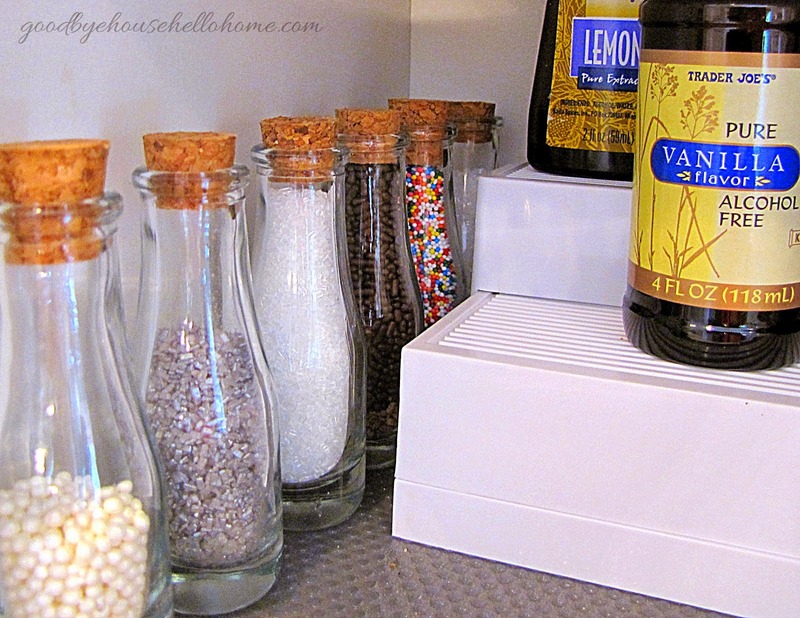 The bottom shelf holds spices, extracts, and my favorite: sprinkles. (As you may have noticed, I put many of my ingredients in matching, see-through containers. Below the spices cabinet is the utensil drawer. These are really, actually, truthfully ALL the items in this drawer, and the only items I use. I decided a long time ago to keep the most-used items, because the rest was clutter. 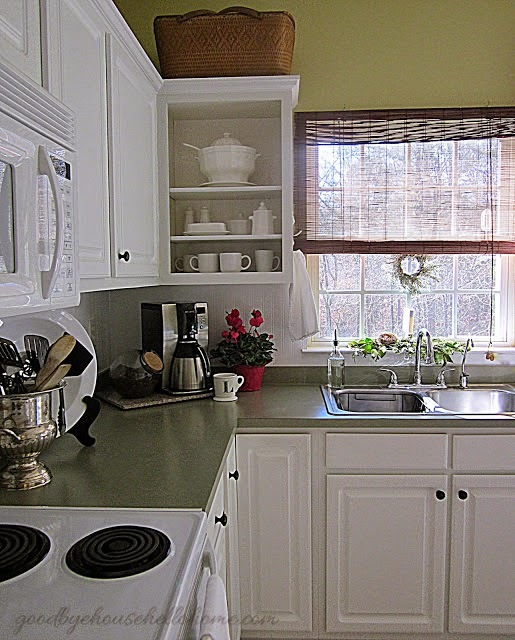 The lower left cabinet contains all of my casserole and pie dishes. Again, these are all I use and are plenty. 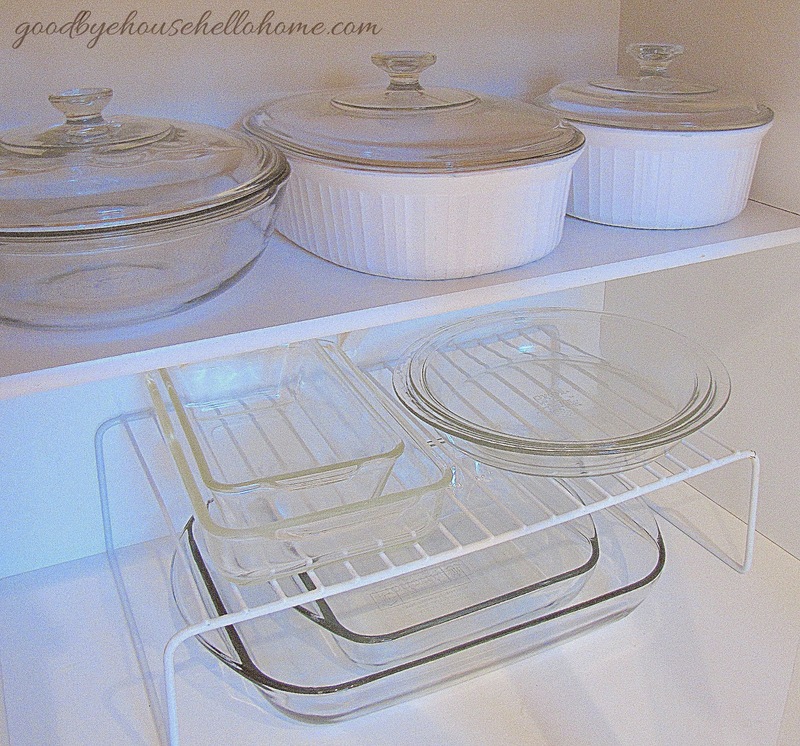 The cabinet to the right of the casseroles houses more pans and necessities. In the bottom oven drawer are Below the oven are flat and flat-ish pans. 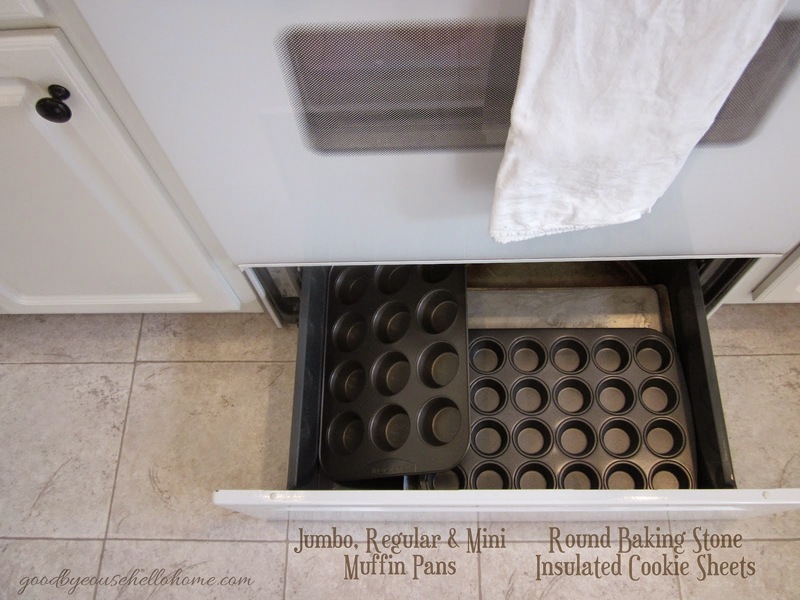 I use the cupcake pans A LOT! and put them in the still-hot oven to dry; this reduces rust. To the right of the oven, the lower cabinet door holds the oven mitts. 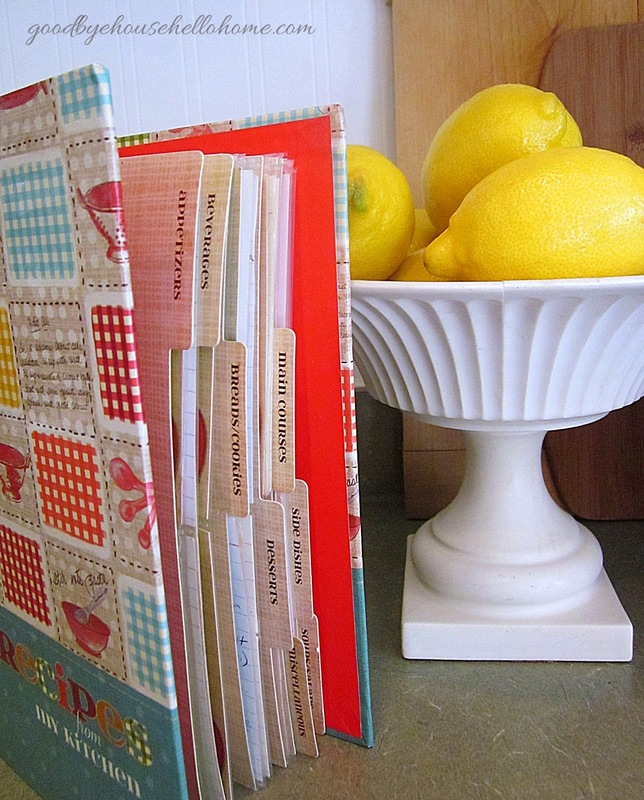 And a picture holder is very handy to hold recipe cards while baking. 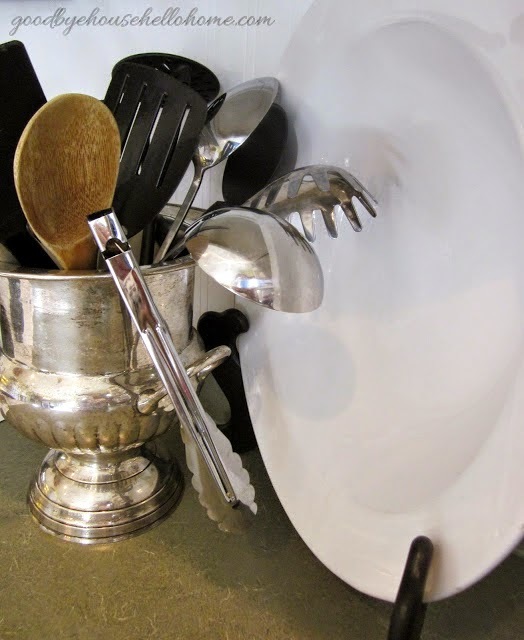 And a silver urn is very pretty to hold tall utensils. As you can see, the refrigerator is to the left of the baking zone, so I can easily grab the eggs, milk, and butter, which makes a nice work triangle. 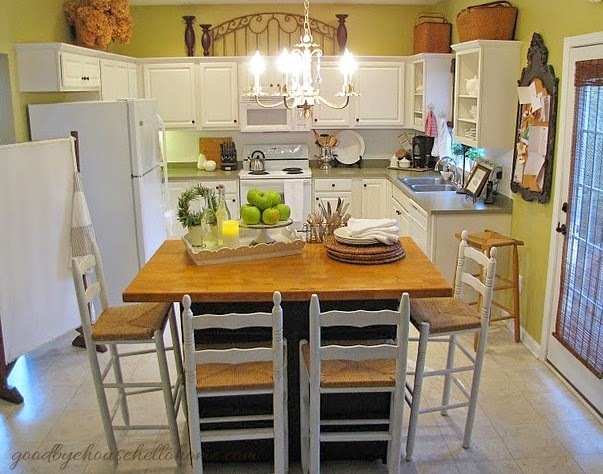 I am blessed with an over-sized rolling kitchen island that was once an old kitchen cabinet, now on casters, which I topped with a butcher block table top, and placed four bar chairs around. We eat here for most meals. On the backside of the island is storage. because I use these the least. Other pictures of my kitchen. Across from the French doors is the pantry. 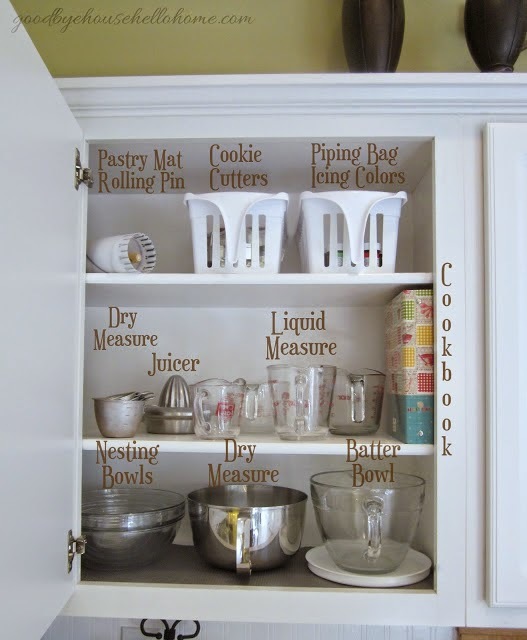 Many times, things that are stored in cupboards aren’t actually needed in the kitchen; for example, fancy china, serving trays, special occasion utensils, crystal bowls, or vases. 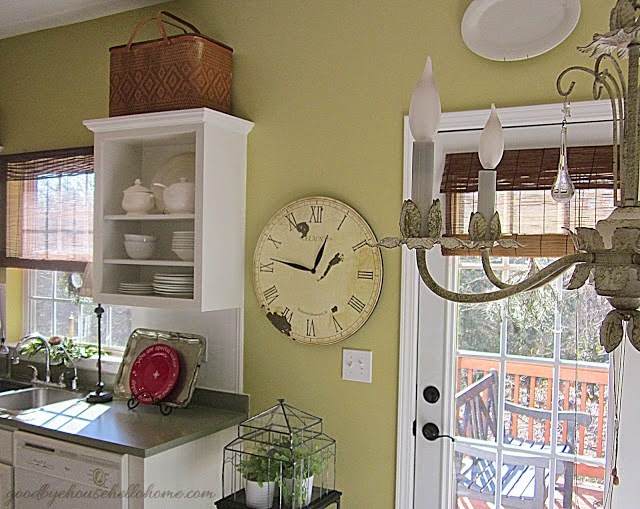 Move these to other areas (perhaps the dining room) to free up shelf space for your more frequently used items. 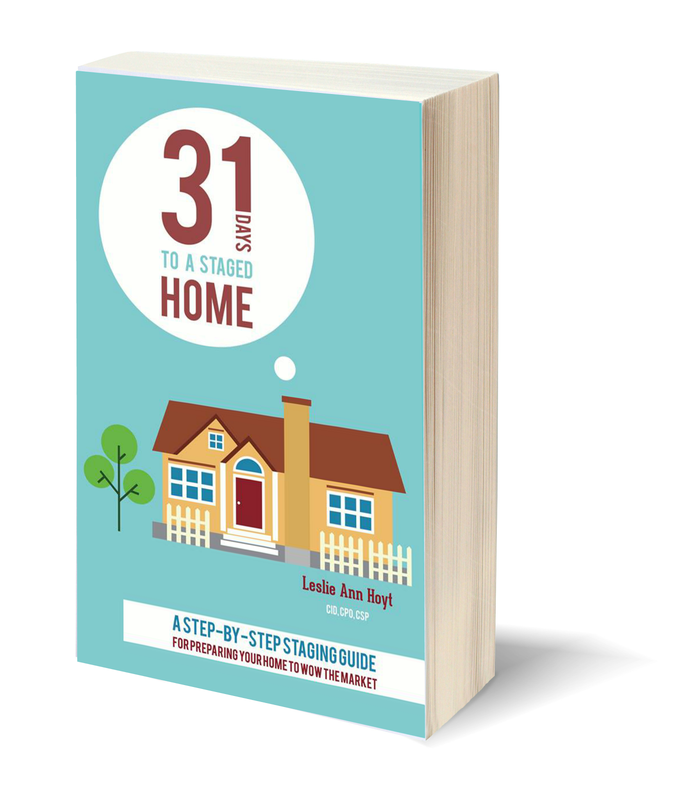 Go through your cookbooks and remove the ones that you don’t like or use. 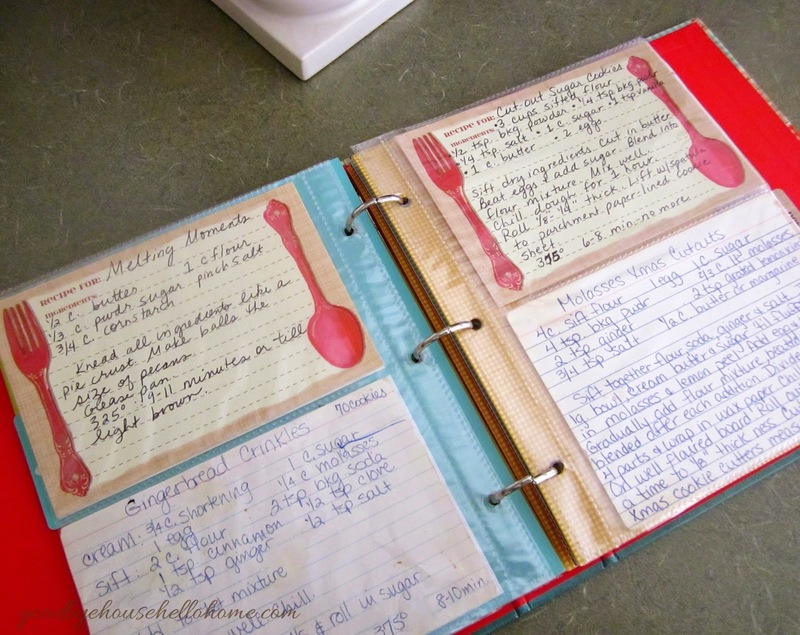 Get your loose recipes into a 3-ring binder, divided into sections. 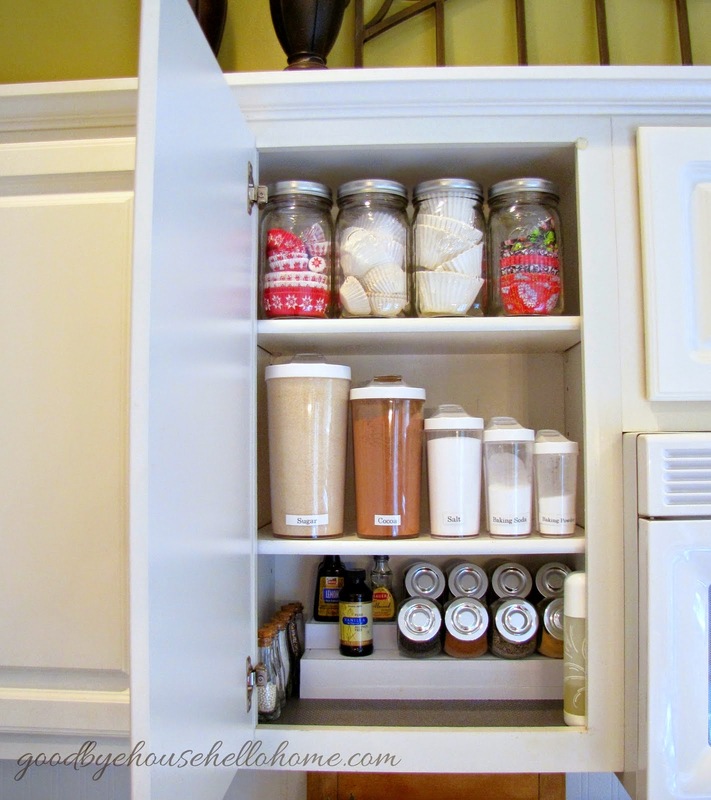 If you don’t have a separate pantry, make use of stepped organizers, sliding shelves, and turntables inside your cabinets. 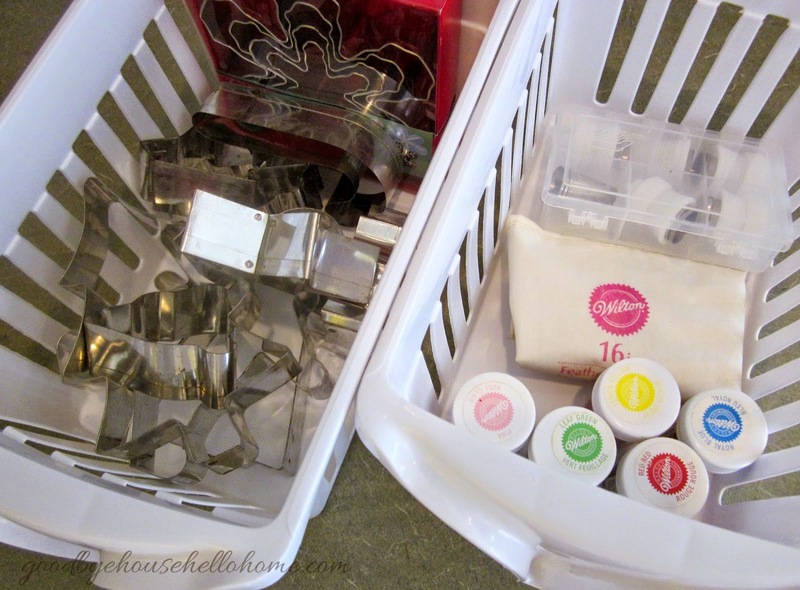 Baskets work well to keep like items together. Labels help the family to know where to store items and make it easier for them to help to put groceries away after a shopping trip. 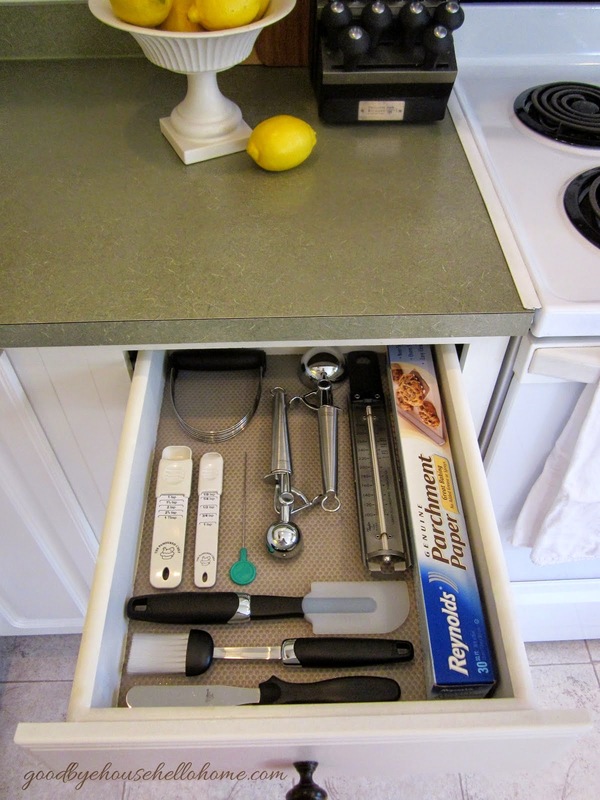 If you are spending more than a few seconds searching for a particular utensil, then it’s time to purge your drawers of the unused items. Ask yourself what is really necessary. You may need less than you think that you do. How many dish towels and oven mitts do you need? These linens typically take up precious drawer space. I suggest seven towels, one for each day of the week, and four oven mitts: two square and two hand mitts. 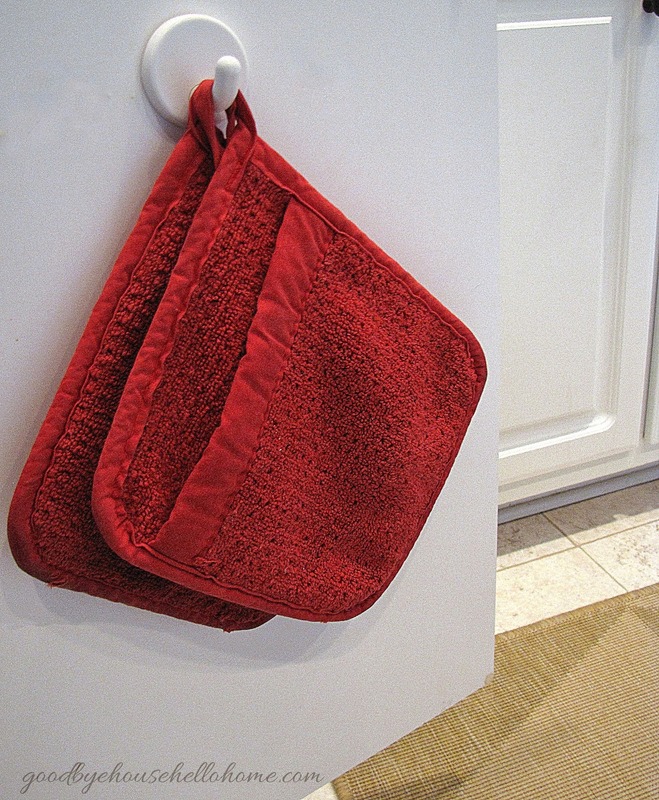 Hang them on the inside of the cabinet door nearest to their use on hooks or over-the-door towel bars. And a re-organized walk-in pantry HERE. I pray that each of you will have a beautiful day making your home! A Bowl Full of Lemons is organizing her coffee station. 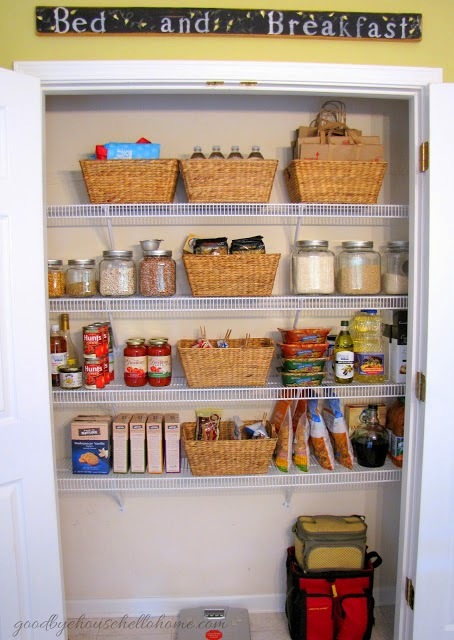 Organizing Made Fun is organizing her walk-in pantry. Organizing Homelife is organizing her kitchen command center. Organize and Decorate Everything is organizing her refrigerator and freezer. I'm an Organizing Junkie is organizing her lazy Susans. Clean Mama is organizing her cupboard drawers. to see what we're pinning! Your kitchen is amazing! I'm seriously in love! Aww... thank you, Leanne! Muah! Can I come and bake with you Leslie? Looks amazing! Please, Becky! Yes! Come on over! WOW! So organized! Your kitchen needs to have a talk with mine! Beautiful kitchen, Leslie. 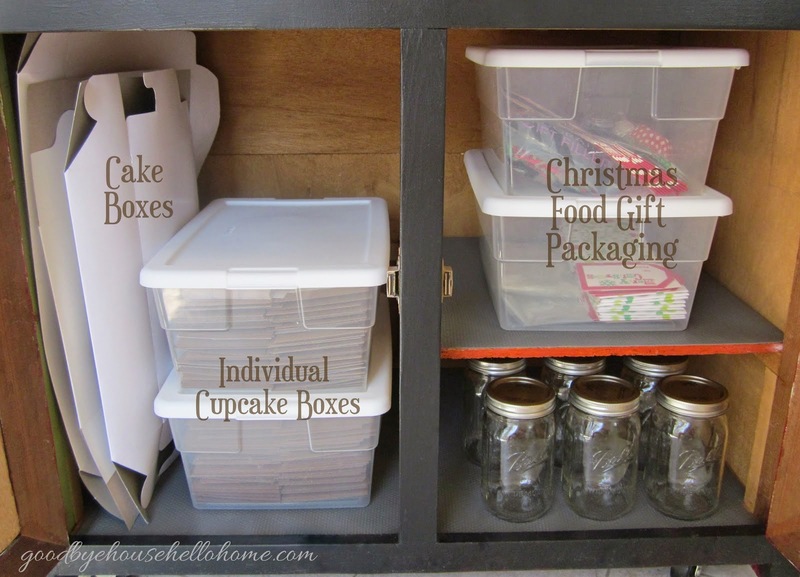 Again, inspiration for me to get better organized! Oh my word, this is fantastic. I need to purge and organize. I love your kitchen. Hi Marty! Purging is my friend, LOL! 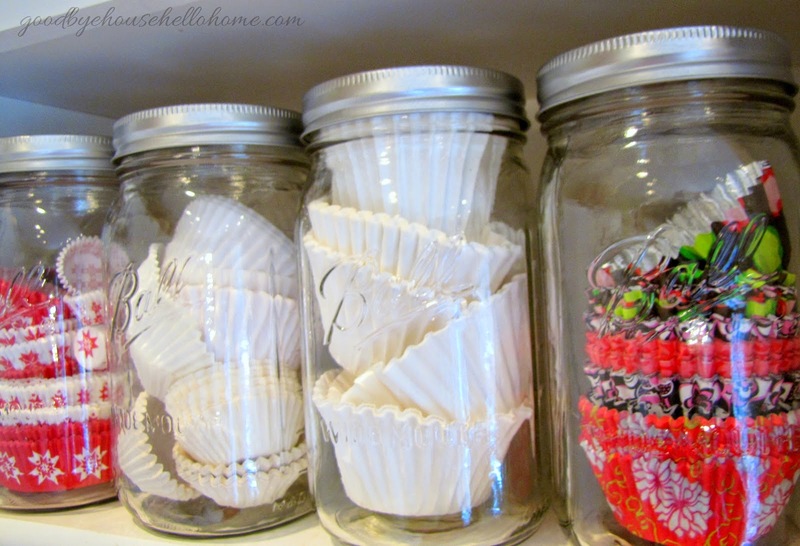 The first thing I am going to do when I get home is put my cupcake liners in a Mason jar! What a great and cute idea! Love the containers for the soda, salt etc. Where did you find them! 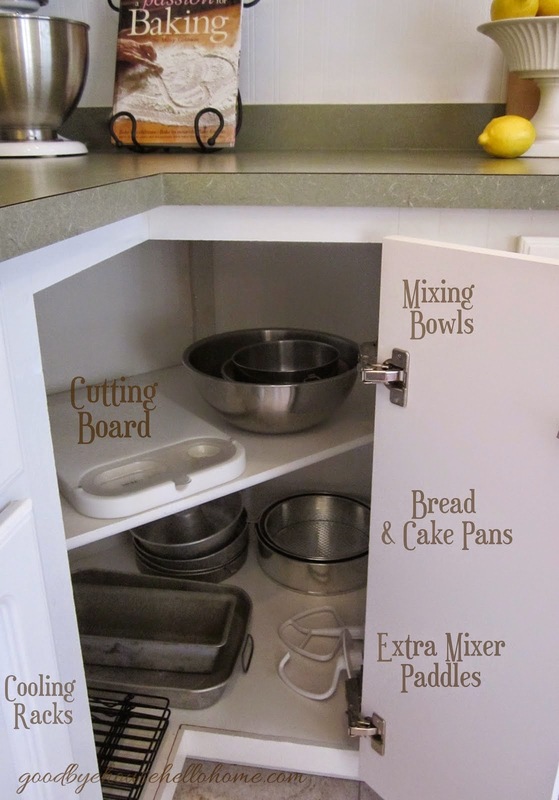 Great kitchen organization! I'm inspired. 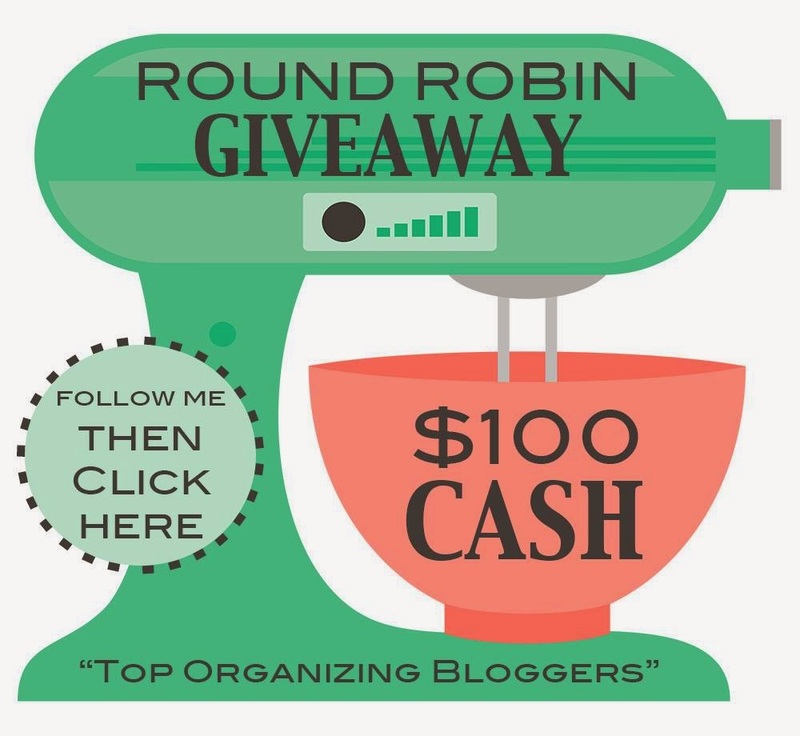 So many great ideas and I love your kitchen. Thanks for all the tips. 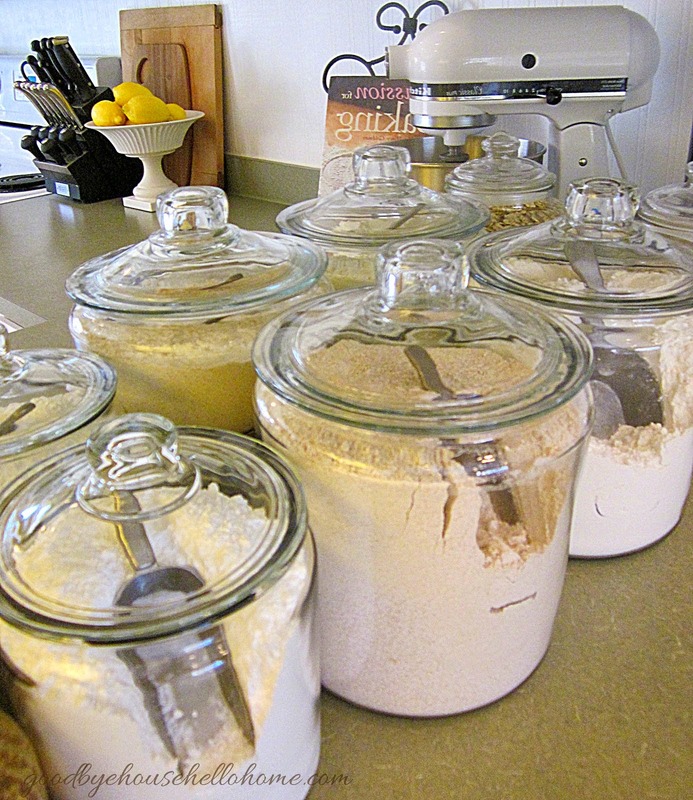 Great organization but I also like the idea of the mirror behind the canisters...looks great! My first visit but will not be the last. 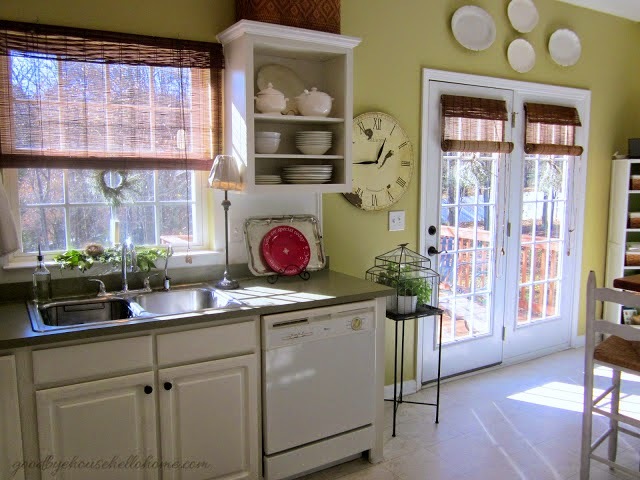 I love this so much and your kitchen layout is similar to mine. 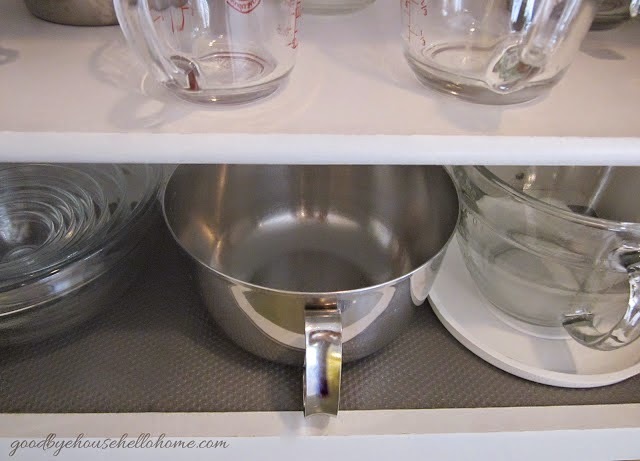 Do you mind if I ask where/how you store your pots, pans and lids? I keep coming back to this post and I find it all just perfect. Thank you for sharing. 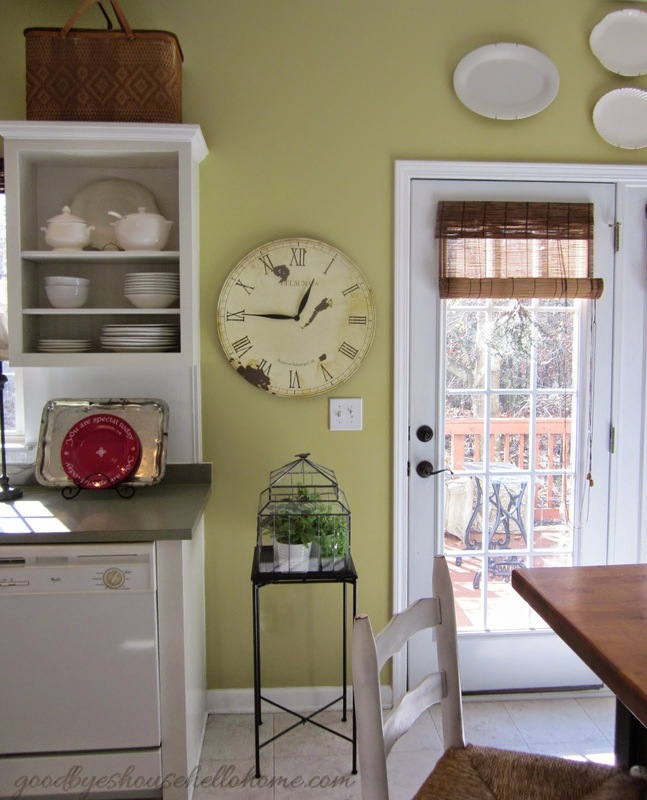 Your kitchen is fabulous ! 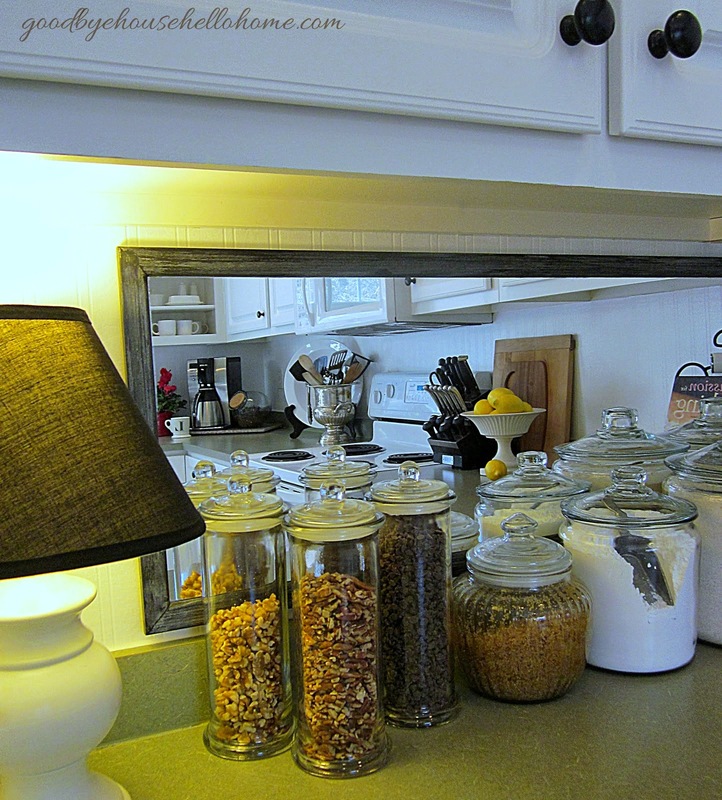 I wish the one in my home was that organised..I love the idea of placing a mirror behind the jars! You inspired me to add a mirror in my kitchen as well! Thank you.